Experiments as LHC, new B factories, earth- and space-based astro-particle experiments can give us a unique opportunity to understand long-standing puzzles in Electroweak Symmetry Breaking, Flavor and Dark Matter. The goal of the scientific program is to interpret the results coming from a wide range of experiments and to formulate a coherent framework to account for them. At the same time, outdated models and schemes no more on line with experiments can be identified, together with theoretical approaches based on more solid basis. The status of high energy physics field in 2014 can emerge, and directions can be given for future progress. 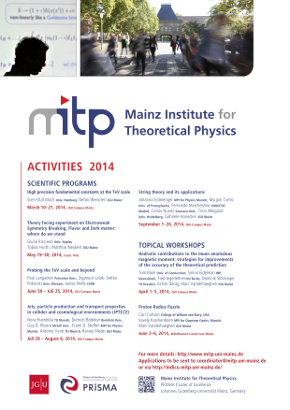 The purpose of this program is to bring together key figures across disciplines in order to facilitate the development of a highly integrated approach to the challenge of new physics.